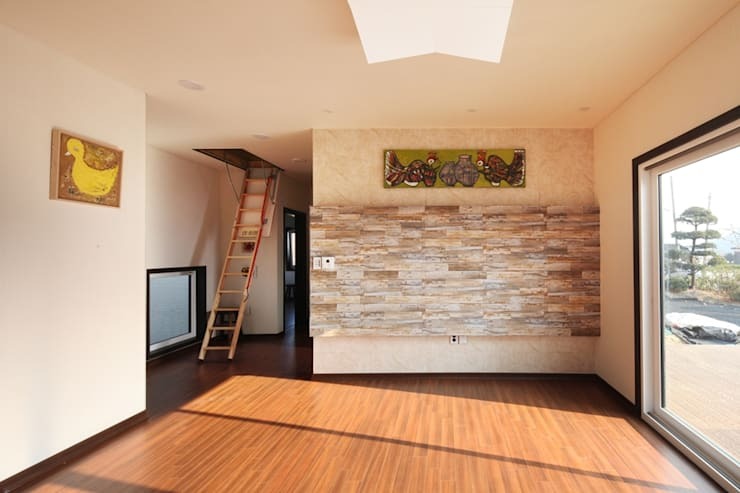 Today on homify 360°, we are off to South Korea to catch up with architects Yunsung Housing. Catering for a client who sought out a minimalist yet stylish home, our professional team constructed a single-storey residence that flaunts simple and modern lines, both on the in- and outside. With a 120-square metre surface, our experts set off to create a comfortable living space that will make the modern family of the 21st century feel right at home. 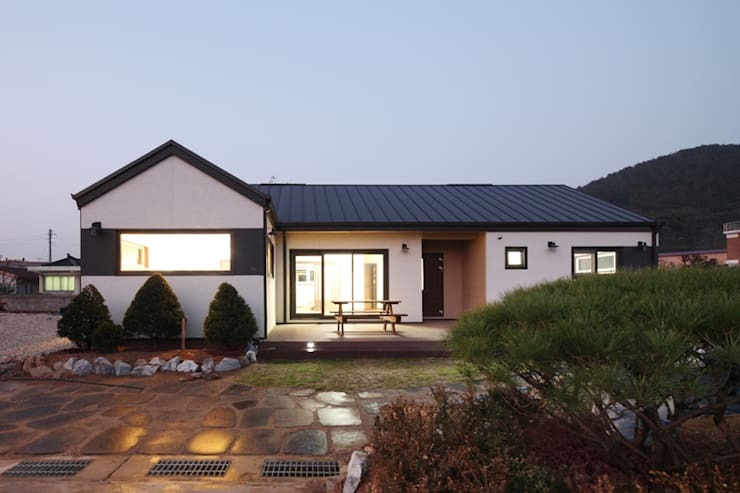 With high-quality surfaces (including heated floors), durable materials, and comfortable areas, this modern abode is a delightful vision of contemporary Korean architecture. Let’s discover this mighty, yet extremely modern bungalow. We locate our discovery for today in a rural area, which makes those modern lines stand out even more strikingly. Although varying considerably around the world, the typical bungalow boasts only a ground floor living space, with a relatively low ceiling to accommodate an attic / loft area – just as our example will show shortly. A tranquil off-white hue was chosen for the facade colour, making those dark doors and window frames stand out quite superbly (and link up with the dark-hued roof). Delightfully trimmed conifers greet us at the front, as a charming stone path leads us closer to the front door. A very friendly face as far as first impressions go! Just like we promised, an attic area is located in the house, with a folding ladder instead of a staircase opted to save on floor space. And we’ll discover what’s up that ladder in a moment. Flooring comes to us in the form of warm honey-toned timber, adding some delicious rawness to those interiors. A piece of decorative stone adorns the main wall, adding some superb pattern to the neutral palette. Any item placed there (from a TV set to a bookcase) is guaranteed to stand out stunningly. What do you do when you have a love for two distinct tile styles, but just can’t commit to using both of them in the same space? You split the space in two, as shown here! 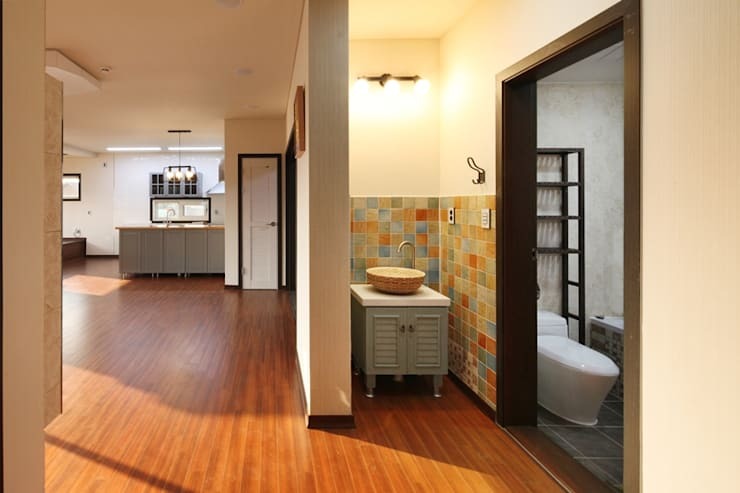 The sink area was moved to its own open, niche-like setting, while the toilet and bathing area remained in the private area of the bathroom. We just love those charismatic wall tiles of the sink area, with a combination of different hues displaying water-, earth- and wood elements. 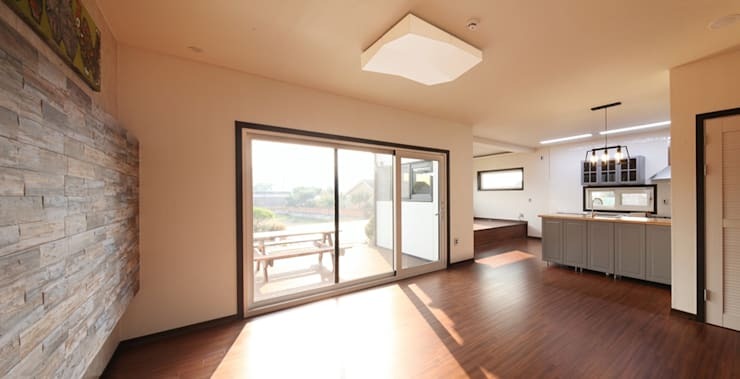 We all know the benefits of natural lighting, and our designers for the day definitely appreciate it as well – why else would they have added that lovely glass sliding door the living area? We love how open and free-flowing this space seems, thanks to the neutral colours and lighting. And because it is an open floor plan, that means the absence of walls also contribute to a seamless space, just waiting to be adorned with trinkets, colours and patterns. Even though this house boasts a modern design style, there is something decidedly country about the kitchen. Those warm wooden counter surfaces and painted cabinets exude a vibe that is most cheery and comfortable – what else would we expect from a family kitchen? 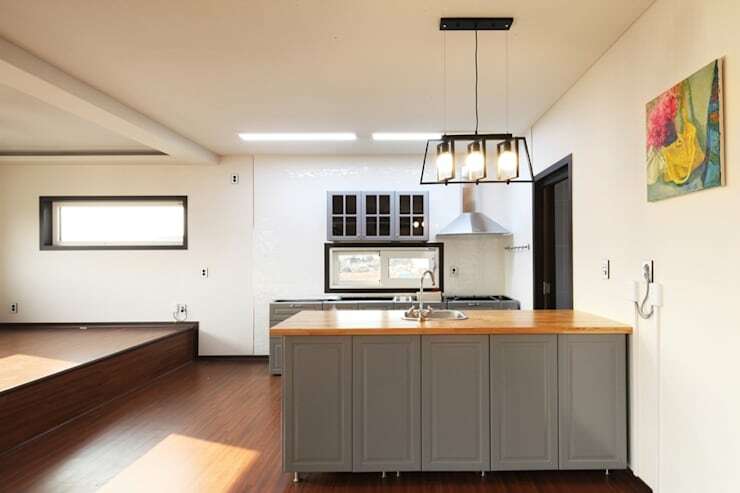 A U-shaped layout was chosen for the kitchen, maximising the work triangle (fridge, oven and sink) to perfection, and ensuring an open area that is equally fit for cooking and chatting. Up that little ladder and where does it lead us? Certainly not to a dark, damp and forgotten attic space! This room presents an abundance of space, is extremely well-lit, and exudes a calm and soothing effect, thanks to those dusty pear-green walls. With its positive vibes and spaciousness it can be used for an assortment of different activities – from a second bedroom to an art studio. 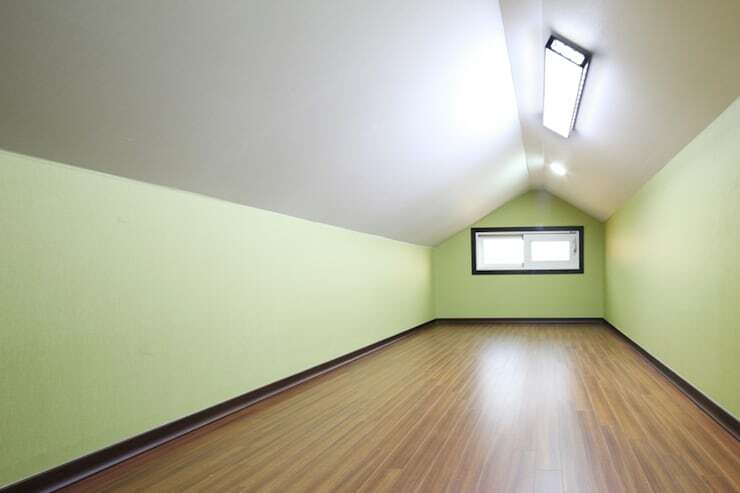 Let’s see some more: Top Tips For Your Attic Space. On to the main bedroom, where we locate the same horizontally elongated windows as the loft space. This ensures more privacy for our residents, yet also welcomes a dash of sunlight into the room. But no need to fear the darkness, as the artificial lighting here is more than enough to illuminate this stylish space. Need some inspiration for your sweet dreams? See homify’s wide range of stylish bedrooms. 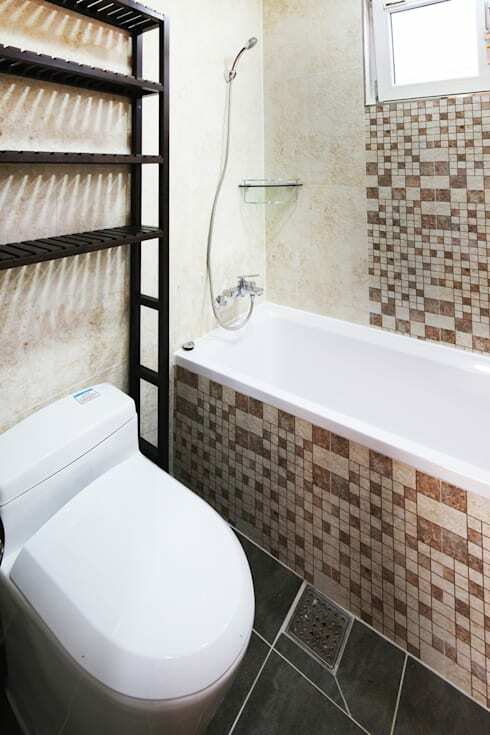 We close off our tour with a quick look at the bathroom – the room adjacent to the sink area that boasts those charming tiles. Strongly contrasting with the sink’s colourful tiles, the bathroom displays a more earthy version of neutral tones, with mainly creams and beiges taking care of its colour palette. Notice how the pure white surfaces of the bath and toilet balance with the dark floor tiles, ensuring a firm contrast between colour and material. Charming and very cosy? Or would you rather keep looking for something else? Tell us your thoughts on this house.